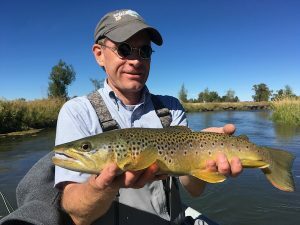 George caught this gorgeous brown on the Beaverhead River in southwest Montana with Healing Waters Lodge. How many times have you said to yourself or said out loud to a crowd, “I love to throw streamers, I’m just not very good at it.” Then, we’ve got a deal for you! Healing Waters Lodge – Fall Fly Fishing School: Offering a six night stay at Healing Waters Lodge, all meals included, with 5 days of fall fly fishing instruction and guided fly fishing, all for $2,995 per person. Please contact Mike Geary today, 406-459-2030 for details.